I’ve been to “Hellboy” and back — to let you know that this reboot is one of the worst films of 2019. 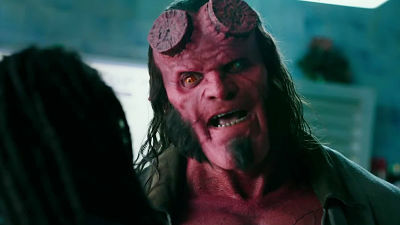 Guillermo del Toro’s 2004 and 2008 “Hellboy” movies were beloved by critics and fans. But two minutes into director Neil Marshall’s take the Dark Horse comic, you’ll realize it’s your money that you just burned. Ron Perlman’s career benefited tremendously from starring in del Toro’s versions. “Stranger Things” actor David Harbour’s resume has descended into hell with this role. Hopefully, for his sake, only temporarily. But at least he gave it his all: wearing the makeup and suit, and persevering through reportedly strenuous production issues. According to The Wrap, Harbour walked off set “repeatedly”, as Marshall and producers argued over the direction of the film. Also, it’s rumored that Harbour and Ian McShane (who plays his fiery father) re-wrote a number of scenes. And the BTS drama carries over onto the on-screen product. Watching “Hellboy” is a relentless, angry two-hour experience. Daniel Dae Kim, who plays an agent who turns into a jaguar, constantly looks like he wants to drive a Jaguar off set and get as far away from this production as possible. I know the feeling. And what’s up with the giant talking boar? We’ve seen this guy in at least three other recent action films. The scope of the story takes us from 500AD to present day. King Arthur and Merlin makes appearances, as do marrow-sucking giants and a couple of hideous witches. Warning: If you see this movie while on a date, there’s a kissing scene that, well, let’s just say you’re chances for romance post-movie will be zero, because you won’t be able to get that scene out of your mind. In a sense, “Hellboy” succeeds in depicting truly disgusting characters, who get sliced, split-open, decapitated and pulled apart, with body parts flying everywhere. At times things get downright repulsive. Heavy rock selections blare throughout the cheesy, messy action sequences to add fuel to the fire. On The Official LCJ Report Card, “Hellboy” gets a D-.